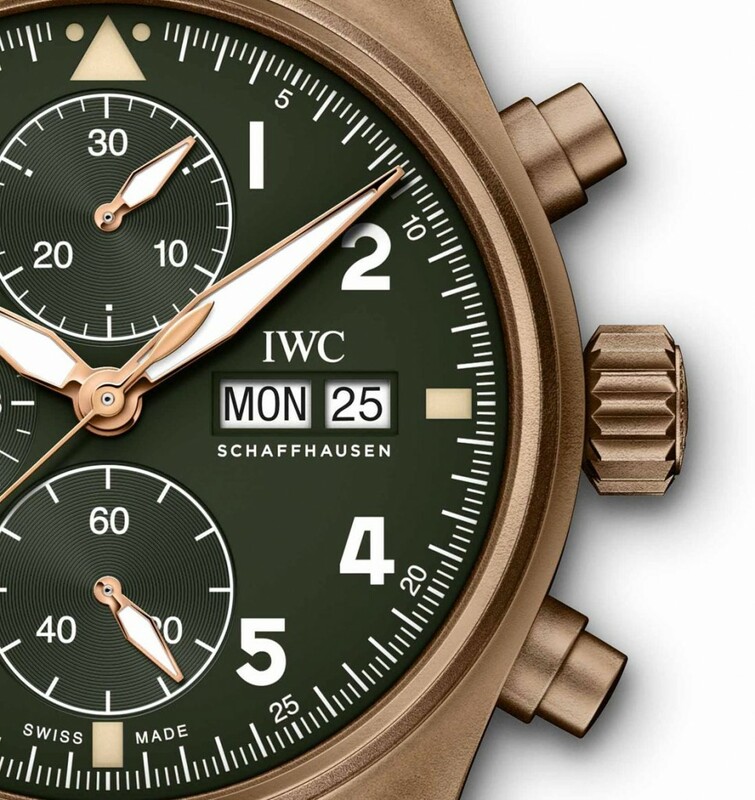 A fleet of new arrivals is descending from the heavens to SIHH 2019, thanks to IWC Schaffhausen. 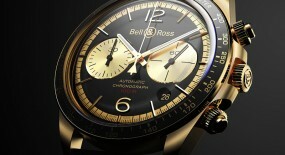 In total they are releasing seven new models, but let’s focus in on a couple of pairs. 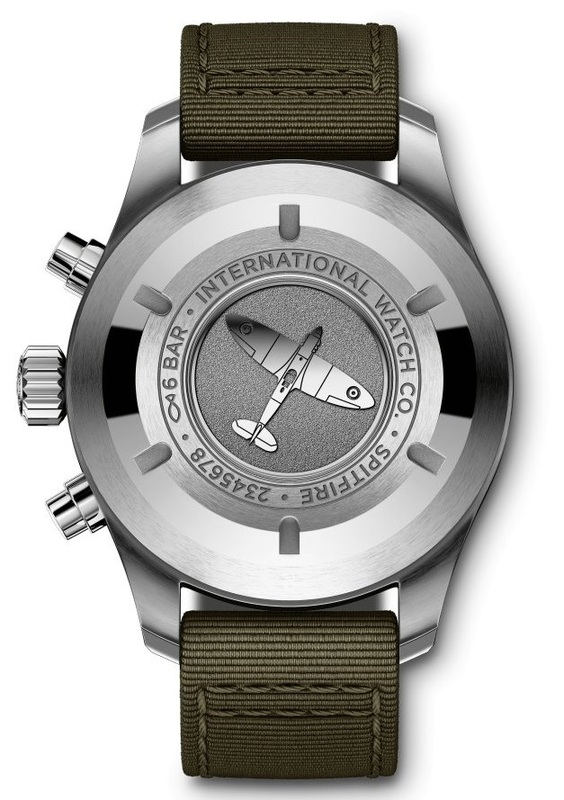 As we run down these pairs, we encounter the: “Pilot’s Watch Chronograph Spitfire”. 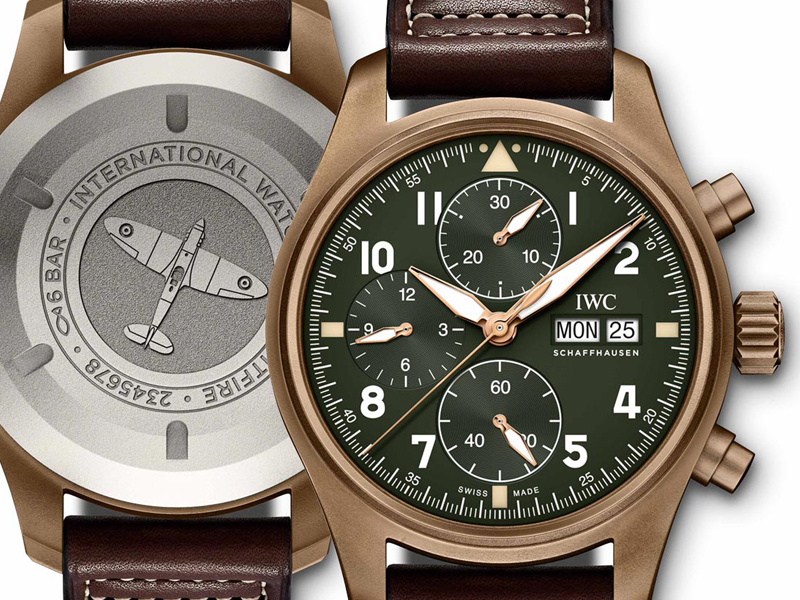 These aren’t the first Spitfire chronographs that IWC has produced or currently holds in production, but they do offer substantial distinctions to their predecessors. 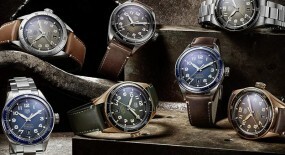 Besides the bronze option, previous models held a diameter of 43mm wide, while these new offerings have been given a tidier wearability by slightly reducing them to 41mm. 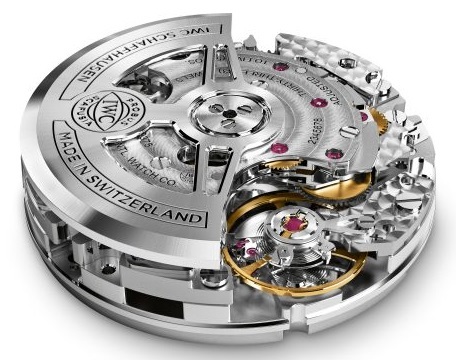 The ETA-based movement has also been swapped for the IWC in-house 69380 movement. 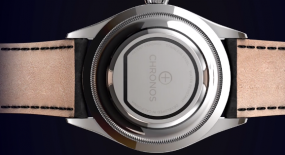 Another noteworthy detail was the titanium case back given to the bronze version, ensuring no writs discoloration. 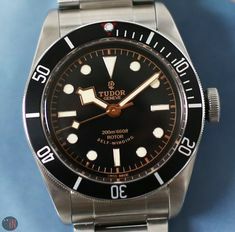 The 41mm case is available in either stainless-steel with a steel case back or bronze with a titanium screw-on case back. 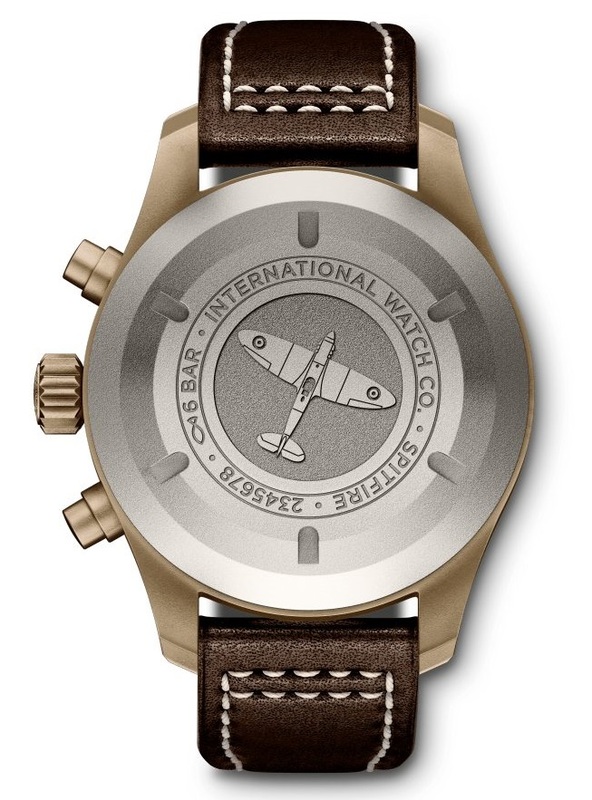 Engraved on each of these case backs is the Spitfire airplane model, which this model line has been named after. 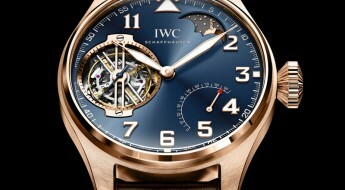 IWC has added a soft-iron inner case for protection against magnetic fields. 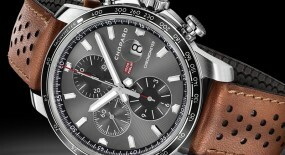 This models comes equipped with two push-pieces to activate the chronograph functions. 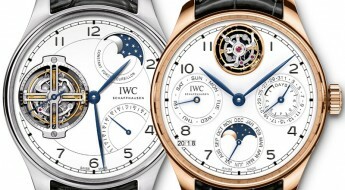 It also comes equipped with a screw-in setting crown in-between the pushers, which has been engraved with the IWC logo and a riveted circumference, for an easier reinforced grip. 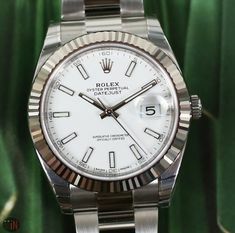 All topped by a convex sapphire glass with an anti-reflective coating on both sides. 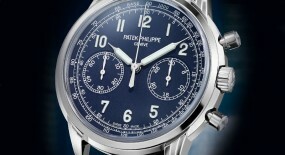 The glass has been secured against displacement by drop in air pressure. 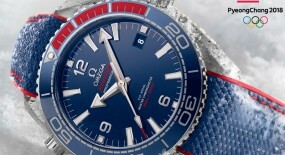 Water-resistance on these watches is capable of reaching up to 60 meters (196 feet). 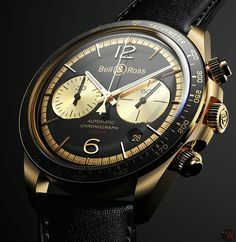 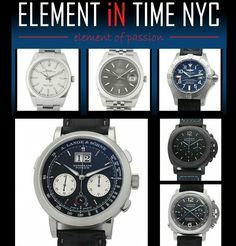 Time is exhibited on either a black (steel version) or an olive green (bronze) dial with white Arabic numerals, followed by small white seconds’ markers, slightly longer minute index markers and Arabic numerals for every 5-minute increment. 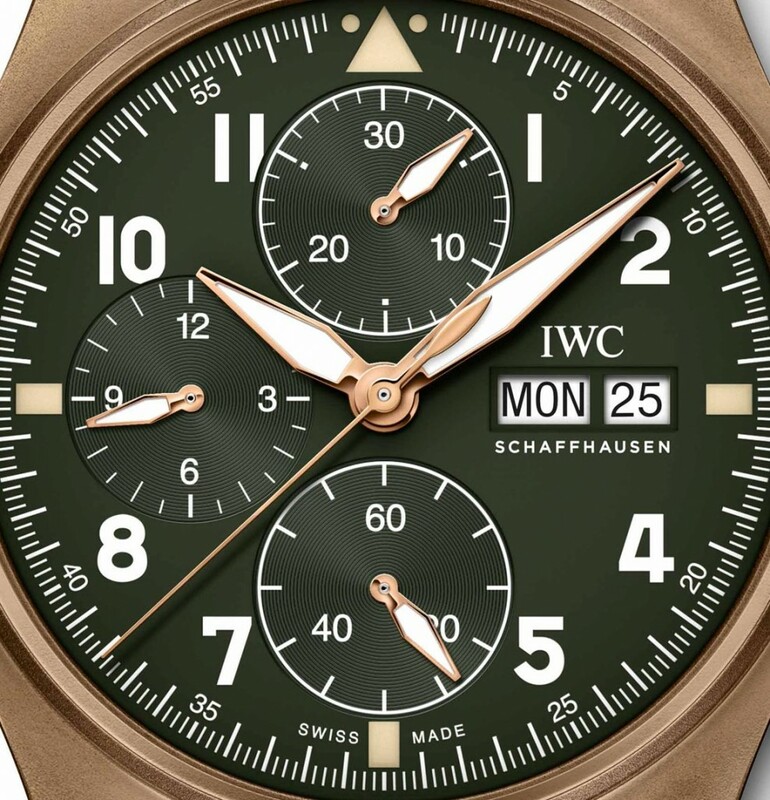 Plus both dials also feature IWC’s iconic triangle with two dots marker and have excluded the 3, 6 and 9 o’clock numerals for faux-patina beige colored index markers. 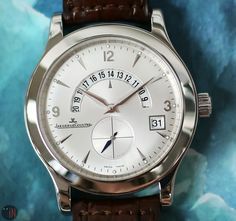 There are sub-dials: a sub-seconds at 6 o’clock; a 12-hour counter at 9 o’clock; and a 30-minute counter at the 12 o’clock position. 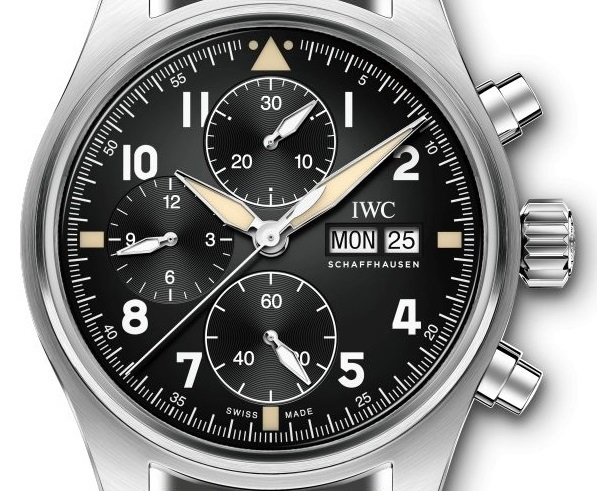 It also includes a white two-window day-date aperture aligned with the 3 o’clock markers, while in-between the brands “IWC SCHAFFHAUSEN” inscription. 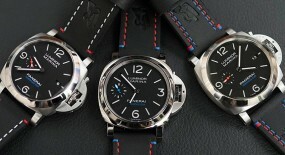 The central dagger-style hands and all three sub-seconds hands on the green & bronze model are white; while the black & steel version have been colored with a faux-patina beige-like hue. 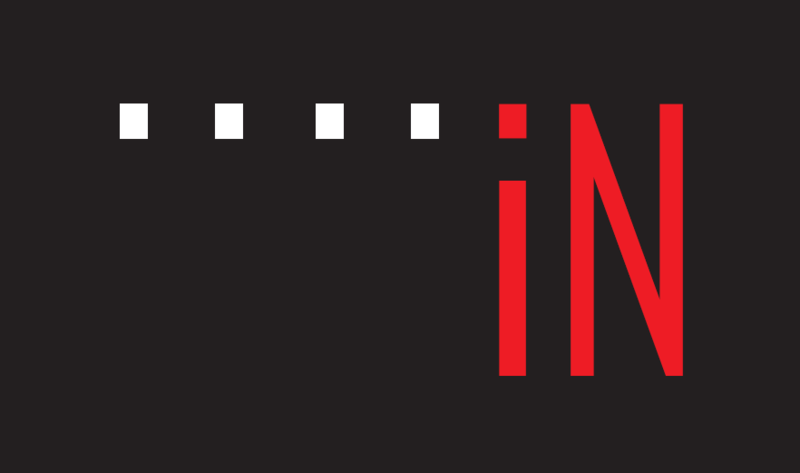 But, in common both options have added a luminescent filling to all of these pointer hands, for an enhanced legibility. 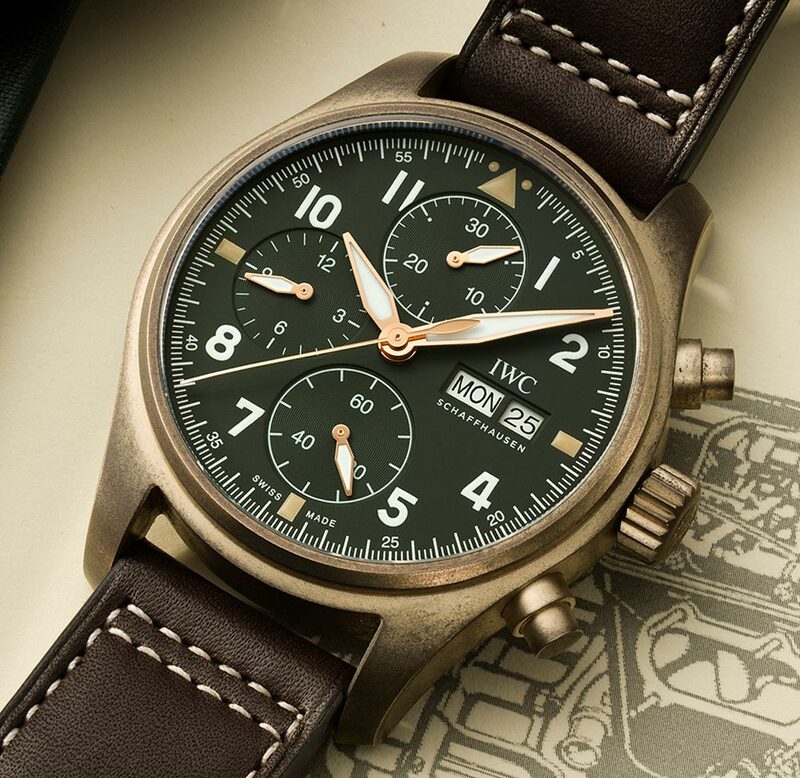 The “IWC Pilot’s Chronograph Spitfire” (Ref#: IW387902 – Bronze) is powered by a self-winding in-house mechanical movement, caliber 69380 with 33 jewels and 28,800 Vph. 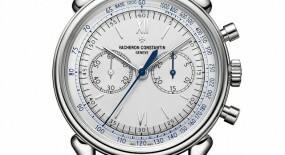 Power reserve on this watch can last up 46 hours, when fully wound. 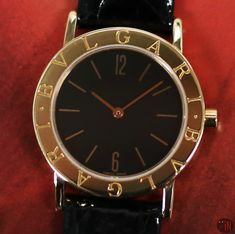 Mounted to this watch is a brown calfskin strap with exposed contrasting stitches, while secured to the wrist by a bronze buckle. 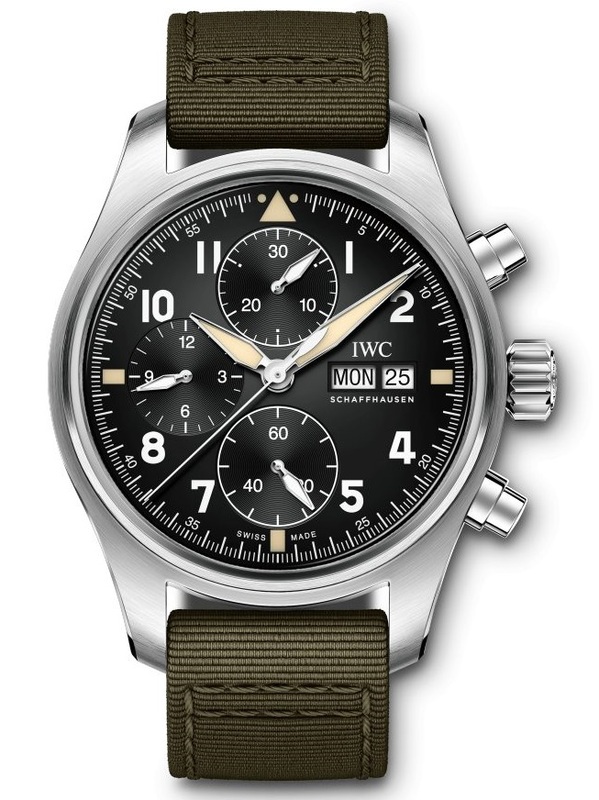 The “IWC Pilot’s Chronograph Spitfire” (Ref#: IW387901 – Stainless Steel) is powered by a self-winding in-house mechanical movement, caliber 69380 with 33 jewels and 28,800 Vph. 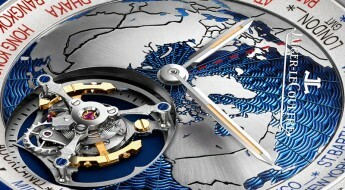 Power reserve on this watch can last up 46 hours, when fully wound. 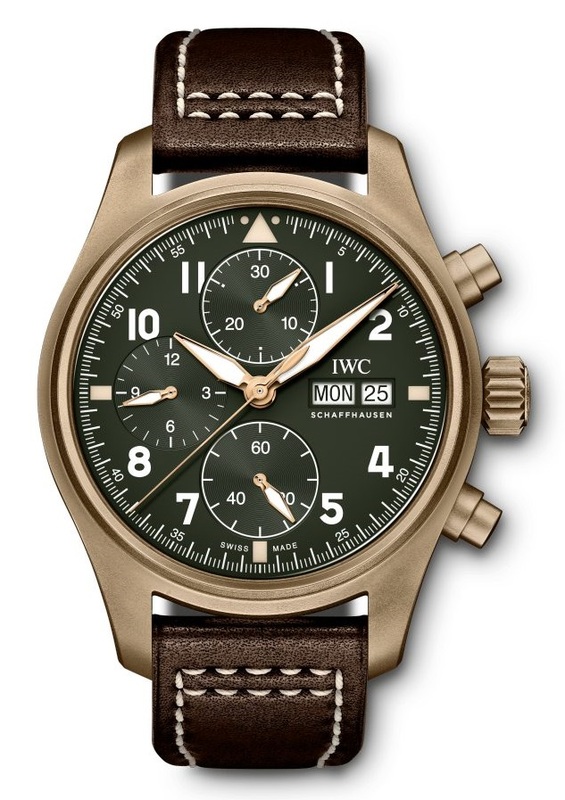 Mounted to the watch is a green textile strap, while secured to the wrist by a stainless-steel buckle.